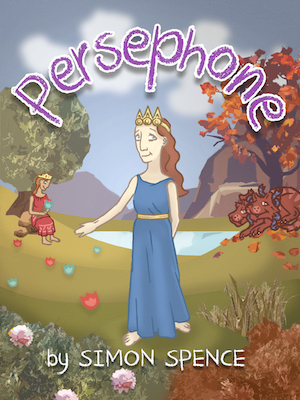 Pre-orders are now available from Apple Books and Amazon Kindle for our latest book, Persephone, which will be released on 28th October 2018. 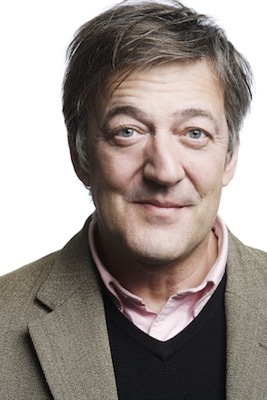 This book has a very special bonus, with a Foreword by actor, writer, comedian and director, Stephen Fry. Many thanks to Stephen for his help with our work and his addition to our new book. 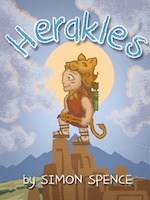 Our fifth Early Myths book, Herakles, is a finalist in this year’s Wishing Shelf Book Awards. We have made the final in “Category 2: Books for 6 - 8 year olds” and the results will be announced at the start of April. Last year our Atalanta book won a bronze prize at these awards and we are delighted to be nominated again this year. 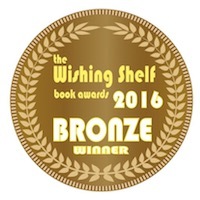 We are delighted to announce that our fourth book, Atalanta, has just won a bronze prize at the Wishing Shelf Book Awards (for 2016 books). We are especially pleased with this win as the awards are judged by schoolchildren and teachers, and as much as we have been thrilled to win every award, this one is special because of the endorsement from the kids. We have launched two new paperbacks this week- our award-winning Odysseus and our newly launched Atalanta are both available on Amazon! Apple have released iOS 8.4 and with it, allows for iBooks to be downloaded on an iPhone. 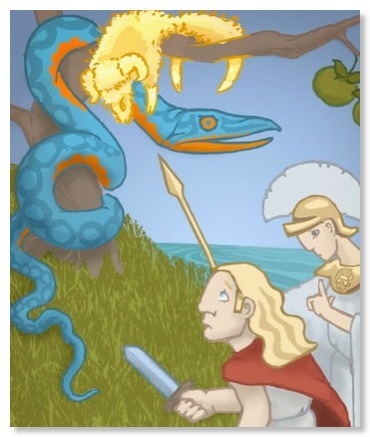 This means that you can buy and read our Early Myths books on your iPhone, iPad or Mac. The books work great on the small screen, and especially on the iPhone 6 Plus. It was always odd that Apple did not support iBooks Author creations on the iPhone 6 Plus from the start. We use iBooks Author in the creation of our multimedia books and it is wonderful to now see them available on most iOS devices. The audiobook version includes sounds and effects to give a beautiful fourteen-minute telling of our story. It is perfect for car journeys and for children to sit back and listen to the tale. The audiobook only costs €3.99 / £2.95 / $3.95 and it available to download now. Apple iBooks Store, Amazon Kindle Store and paperbacks are available through our own Store. We are delighted to announce that our latest book, Odysseus, is now available from the Apple iBooks Store, on your Mac or iPad. This is he third book in the Early Myths collection and costs €2.49, US$2.99 or GB£1.99. 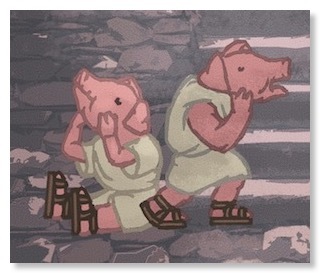 The tale follows the adventures of Odysseus, one of the great Greek kings. He unwillingly departs from his home to fight in the Trojan War and is a key player in rescuing Queen Helen. But his travels only begin after the end of the war, as he faces monsters, nymphs, gods and witches on his way back home to Ithaca. He must also face a challenge to his authority back in his palace before he has the chance to be reunited with his wife, father and son. 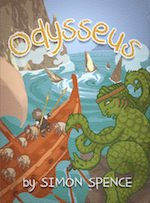 Odysseus is available exclusively on the iPad and Mac through the Apple iBooks Store. We are working away on our new book, Odysseus, which is due to be launched this Autumn. This will be the third book in the Early Myths series, following on from Perseus and Jason & the Golden Fleece. We have been working on the scene of the Trojan Horse and think we have a great image for this part of the tale. 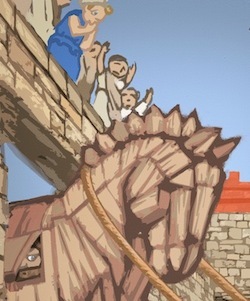 The image shows Cassandra above the gate as the horse is pulled inside the city of Troy. Odysseus takes a quick look out through a flap, while the rest of the Trojans celebrate their “victory”. We are now working on another image, the palace of Alcinous, where Odysseus tells of his travels and seeks the assistance of the king and queen. We are in the middle of working on our new book, Odysseus, which is due out later this year. We have completed about a third of the images and are hard at work on bringing one of the most famous of the Greek myths to the Early Myths series. 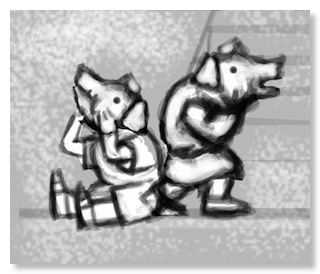 When we come to work on an image, the process involves a number of stages. Step 1: When we worked on “Jason and the Golden Fleece”, I provided our artist with the following images before he worked on the first draft of the Phineus episode. 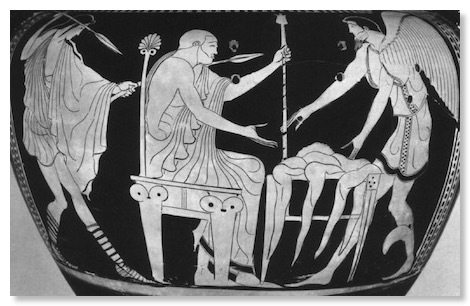 Attic red-figure column-krater from 460 B.C.E. Jason, Phineus and one of the Boreads. 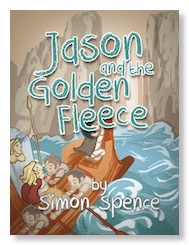 Our latest children’s book, Jason and the Golden Fleece, is now available on the Apple iBooks Store. It is the tale of the hero Jason who is raised by a centaur in the Greek mountains, before he returns to his city and challenges the evil king for the throne. Jason leads the Argonauts across the seas to the edge of the known world to attempt to win the magical Golden Fleece. We delivered our next Early Myths book to Apple this weekend, with Jason and the Golden Fleece due to go on sale any day now. It will be available as a pre-order until May 5th and will then go on general sale. 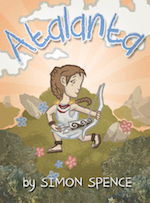 As with all of the Early Myth books, the price will be €2.49 or $2.99. We are delighted to announce that our first book is now for sale in the iBooks store. Perseus is the first in a series of books from Early Myths, and tells the story of an adventurer and hero. Perseus is a tale of a young hero who is banished from his home and must take on a journey to the edge of the world, to face the gorgon Medusa. Dr. Simon Spence has been studying myth and art for over thirty years, and has taught in both schools and universities in the UK and Ireland. He has also retold myths to students and business people throughout the world. Simon is also the author of the (slightly more complex) The Image of Jason in Early Greek Myth, available on the iBookstore: Ireland, UK, US!